1. There is something for everyone. Whether you are a first-year student looking for a part-time job, or a graduating senior or graduate student looking for a full-time gig, you will find over 150 companies looking to recruit students like you. Check out the full list here. 2. You stand out. Attending an in-person event will increase your likelihood of moving forward in an application process. Recruiters will remember your face, story, and qualifications, as opposed to browsing through random online resumes. 3. Practice makes perfect. Communicating effectively and articulating your skills and abilities plays a major role in job/internship application processes. Attending a career fair will allow you to practice your storytelling ahead of time and test it out with real people during the event, preparing you for future professional interactions. 4. The more you know. Career fairs also serve as a great way to meet new people and build your connections. Research shows that over 70% of jobs and internships are found through connections and people you know. Although a specific recruiter might not have the role you desire, they may know someone else who might. 5. You deserve it. As a Hofstra student, you deserve great job and internship opportunities. Companies will take the time to visit campus to connect with our talented students, including you. Make the best of it. Register and view participating companies and organizations. For help with preparing for the career fair, including resume reviews, please stop by The Career Center during our drop-in Quick Question hours, Monday through Friday, 10 - 11 a.m. and 2 - 4 p.m. 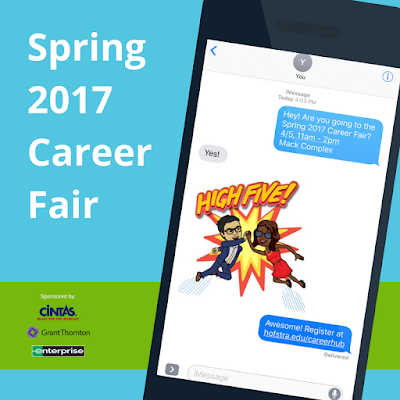 If you have any questions about the career fair, please call us at 516-463-6060. See you soon!